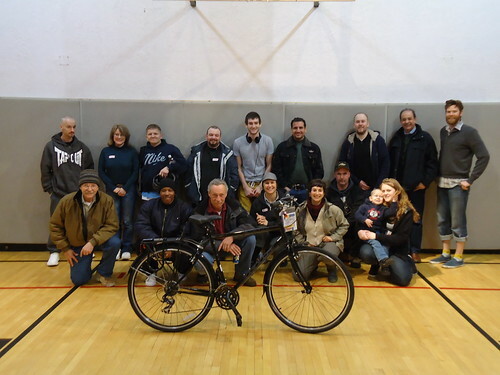 Hope and opportunity met on March 1st when a dozen new cyclists were given bikes as part of the Create a Commuter program. Thanks to a combined effort with S.E. 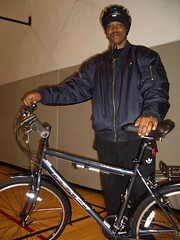 Works’ Portland Partners Re-Entry Initiative – an agency dedicated to helping people successfully re-enter the Portland community after incarceration – riders and facilitators met at the Kern Church on SE Holgate for a daylong class to help the participants get fitted and comfortable with their new bikes. Not knowing exactly what to expect, riders were thrilled to discover they would all be receiving brand new, fully outfitted, all-weather commuter bikes complete with U-locks, lights, flat repair kits, bike maps and helmets. “It’s like a late Christmas,” one participant said. Many of the participants have struggled with difficult pasts and have overcome significant obstacles. Prior to the March event, the SE Works team steadily assisted the group and helped promote them as candidates for the Create a Commuter program. The instructional team, led by Zan Gibbs, led everyone through a day of short presentations and rides, covering topics such as helmet fitting, safe riding skills, proper locking techniques, map reading, and route planning. Even though many riders hadn’t been on a bike in decades, everyone showed ease and confidence within their first few minutes on the road. As usual, the bikes helped bring out the smiles, but they also brought out plans for the future. Cynthia Hannan, a 44 year resident of Ladd’s Addition, is looking forward to bicycling as a “great method for changing her lifestyle.” Her new bike will assist her in commuting to jobs, support groups and visiting her 90 year old mother. The day went by quickly. At the end of the workshop, the group posed for a few pictures, said their thanks and goodbyes, then headed out on their own, ready to roll toward a more independent and active future. As this was the first Create a Commuter event I’ve attended, I was really thrilled to see some of the bikes I helped assemble as a volunteer guest mechanic go into the hands of people who are working so hard to tackle great challenges. Derek is our new volunteer storyteller and was profiled in this month’s Volunteer Spotlight.